By all accounts the CLO business should be going well. Some $3.3 billion of new CLO deals have been done this year already as compared to $4.4 billion for the whole of Q4 of 2011. Seems like a significant amount but this volume is actually quite light relative to historical levels (see chart). 1. In order to execute a CLO deal, a manager needs to have a portfolio of loans ready to go. Most stock traders would say, so what, just buy it in the market. But corporate loan liquidity is quite poor, and to accumulate (“ramp”) say $200mm of loans in order to launch a new deal could take months (weeks if you are lucky). This process is made particularly difficult because loan “issuance” (origination of new corporate loans by banks) has been rather slow (see chart). 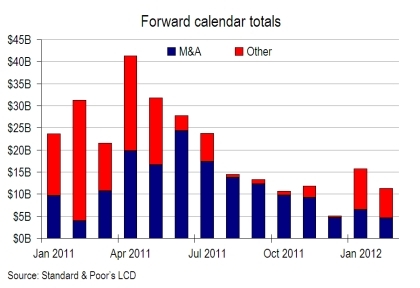 There is practically no LBO activity and the merger activity has slowed down. These are the typical transactions that require corporate loans - the rest is mostly refinancing of existing debt. There simply isn’t enough of new supply hitting the market, making it tough for CLO managers to build portfolios. 2. Prior to the issuance of the CLO tranches, managers need banks to provide a “warehouse” – a facility to finance the “seed” portfolio. The problem is that such facilities these days require 10-15% first loss commitment from the manager. Smaller managers may be required to post that amount as cash in order to obtain the warehouse facility. And that commitment is nearly impossible for some managers. 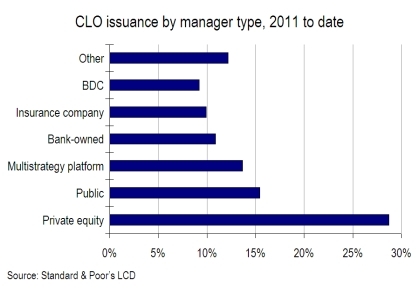 That’s why most CLO issuers in recent years have been the bigger firms (such as private equity). 3. The “equity” tranche for new CLOs has prospective returns of 10-14%. This is due to the fact that senior tranches now require significant subordination by the rating agencies – who are being overly conservative to compensate for their "sins" of the past. Higher subordination makes the equity tranche larger and the returns lower. At these modest returns and given the negative connotation associated with any structured credit, equity tranches are hard to place (particularly with pensions and other institutional investors). 4. It may also become difficult to place the AAA tranches soon. The buyers of these tranches tend to be banks and the new regulations may make holding this paper uneconomical. 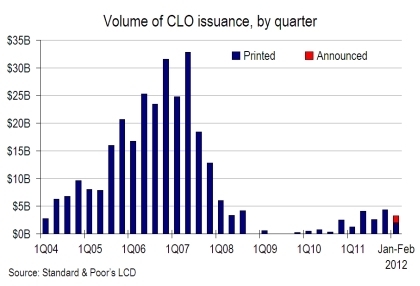 Because of these uncertainties, analysts are divided as to the expected size of total CLO issuance this year. Forecasts range from $12 to $25bn for the whole year. Back in 2007 that would have been a bad quarter.